* My words, not those of Chuang Tzu! P.S. Sherry from "Q" kindly identified these butterflies as "Blue Morpho". I googled it and they are precisely that colour with shimmer and iridescence. So the colours have not been edited to appear more intense. They are that intense! I LOVE them both! Did you ever see the movie Papillon? For some reason, this shot reminds me of his escape into the jungle. What a gorgeous shot. And the words, so dreamlike. The way the blue type contrasts with the back ground and complement the photo is stunning as well. So great to find and artist blogger whose work is pure joy to see! Third time lucky; your comment box doesn't like me! I remember seeing this photo before.. It's amazing..
Wow! What an awesome picture. I can hardly take my eyes off that magical photo. What an appropriate verse you included, too. I love the photograph and the quote. Thanks for posting this one! there, I've calmed down a bit. No, I've never seen the photo before, It is truly beautiful. I love the picture and the words too (yours and Chuang Tzu's). I've never seen butterflies congregate like that. But I guess butterflies are allowed to be friendly if they want. I have too have seen documentaries of "millions" of monarch butterflies returning to the mountains of Central Mexico for the winter. hi bonnie - two years ago i was out on a walk with my wife and some friends when we came across a tree on the edge of a farm. it was covered with monarchs. at first - it was getting on towards dusk - we thought they were bats but nope sure enough they were monarchs. it was not quite as gobsmackingly beautiful as this image - i mean the blue is so vivid - but it was a moment i hope to always remember. Delwyn: Your use of the word "stole" provokes the thought of being wrapped in such beauty . . . but then again I think the tree trunk displays them perfectly. Kathleen: I am delighted that you are too! Yes, I did see Papillon many moons ago. This photo does conjur up a tropical setting. Alaine: Yes, you are right. I thought it was in Mexico. Alaine: Thanks for the link and confirmation! Turquoise Diaries: Yes, truly amazing. The colour!! Dayne: Glad you like the photo, but who could not, right? Searching Soul: Glad you think the verse goes well with the shot. I've noticed lately that many of the great quotations I cite, always reference the word "man" - hard to avoid. Friko: You see, I make one post that drives you crazy, but I always follow it up with one to calm you down! Barry: You are the only one who has commented (or noticed) my little addendum to the poem. Thanks! Jayne: Happy you like it!! Wanda: Amazing phenomenon isn't it? That these fragile creatures could wing their way, every year, thousands of miles - to congregate at the same spot. Steven: That had to be an amazing site - seeing so many monarchs! Thanks for sharing your story. Linda: You are so welcome! That is an amazing picture, not sure how it relates to Vodka but amazing. Liss: There is no relationship to vodka. They just used it I think to grab your attention. In that series of ads, they also had another one with vivid red rose petals lining a path. I cut that one out of magazines too and used it in a collage with a buddha. Thanks for commenting. It takes my breath away. It is stunning! Blue is my favorite color and I love butterflies. It does seem strange that the butterflies aren't photoshopped...but the photo is gorgeous all the same! Oh, how I love your butterfly tree, Bonnie! I collect butterflies, love them and what they represent...renewal! I have been preparing a post about butterflies myself that I have not published yet. We are all thinking about renewal and rejuvenation with a new season upon us! Are there really butterflies as blue as that Bonnie = beautiful picture and lovely words. Sarah: I appreciate your enthusiasm! Vicky: Yes - and then succeeding in getting the shot!! Cat: 2 for 2 - that's great! Sherry Lee: It is hard to believe with that vivid blue . . . Who knows? ChicGeek: I'll keep an eye out for your post. Weaver: Sometimes nature gives us things that are so vivid, or colourful, or intricate that it is hard to believe they are 'real'!! Thanks for commenting. Wow. Gorgeous. I remember once walking through the woods in Ohio in the autumn and coming upon a migration of Monarchs there in the trees, clinging to everything! I will never forget it. These are so beautiful. What color! And the quote...Love that, too. Thanks, Bonnie. Rose Marie: You are so generous! You keep giving poems to us all in your comments!! So sweet. Barbara: That must just send chills down your spine to see it in person!! 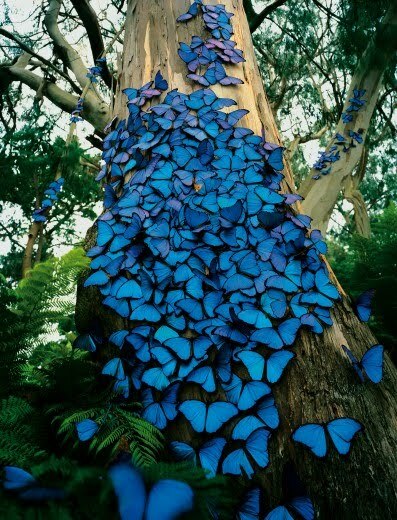 These incredible butterflies look to be Blue Morpho. They are tropical butterflies! The Monarchs are just starting their migration in my area. It is exciting the way the butterflies find their way! I love photographing butterflies...I would have loved to have taken this photograph!! Hi Bonnie~ Exquisite image and reflection! I've heard that in the Native American tradition if you dream about an animal, that animal becomes your spirit guide. What could the butterfly be guiding Chuang? That change is all right? That metamorphosis could possibly be only a metaphor ;) ? That a blue buitterfly brings clarity? So beautiful here today. Sherry (Q): Thank you for identifying these butterflies for us!! Blue Morpho Butterflies. I googled it and they really are this iridescent, shimmering, intense blue. We just could not believe our eyes - but there it is!!! Margaret: Interesting questions. Thank you for dropping by and commenting. that is an amazing shot! could you imagine walking through the forest and seeing that tree...wow. the verse is very cool as well. What fabulous peacock blue color! Oh to walk through the woods and experience seeing this incredible site...a true pleasure indeed! Thank you so much for your comment today. I have to tell you that is absolutely put me on cloud nine and made my day! Stunning! More proof that art imitates nature, because there is no human-made thing more lovely than this. Brian: Thank you. I think I would pass out from sheer joy if I ever came across butterflies like that in real life. Alicia: Glad you like it. Happy that my comment (my daughter's actually) pleased you! If you had not said that they had not been photoshopped, I would have thought otherwise. nature is the best artist, without a doubt. oh no ... i have never seen these before ... stunningly beautiful ... can you imagine the photographer stumbling to quickly get the image before they took flight? that would be a heart rush, for sure! now, if we drink enough of vodka, will we absolutely see butterflies? "Nature is the best artist"!! Thank you. Prairiegirl: Aha . . . you are the one who figured out the connection between the vodka and the butterflies. Drink enough of one and you are guaranteed to see the other!!! Thank you prairiegirl! Absolutely fantastic butterflies! The colour makes me sign and my eyes pop! Very inspired to share this with us all! Thank you!